Such a couple of weeks I've had! We've been stupid busy at the arena with a large variety of shows. In the middle of which I was awarded a nasty head cold courtesy of those fine folks at Disney on Ice. Catering the other day awarded me and a co-worker with a low grade dose of food poisoning, so I've stayed close to the toilet. I've got replacement stock on certain etchings and castings, so today will be a packing day. And best of all, I had a "work party" here Saturday and major progress was had. Trevor Marshall, Ryan Mendell and Robin Talukdar shared the drive down the highway to spend the day and help me out with some of the more tedious tasks involved in layout building. Mostly it was about getting the power busses run from the Digitrax base stations to the west end staging and through the St Thomas yard district. A terrifyingly large amount of 3M suitcsae connectors were used to connect the feeders into the bus, but in the end all the existing trackwork was powered. Trains moved under there own power in the staging yard by mid-afternoon. Shortly there after the first gremlin emerged. I run the F-7s in pairs. I had speed matched the pairs awhile ago, but it would appear that the pairs are no longer matched to each other. One unit lags far behind the other. Oh well. I have plans to remove all the QSI decoders from all the F-7s anyway and replace them with Econo-Tsunamis. As faithful readers will know, I have a bit of a hate on for QSI. When we tried running a loco in the St Thomas power district another major gremlin emerged. Somewhere in amongst the 24 turnouts, 3 diamonds and the turntable a short occurred. My initial suspicion was one of the diamonds, as they can be tricky. But we spent over an hour eliminating the turnout gaps as possible culprits. In the end it was traced down to a missing gap in the cluster of 3 diamonds. Take that nasty little gremlins. Now it's over to turnout controls and track cleaning and maybe next weekend I can test run some trains. This just might peak your interest. 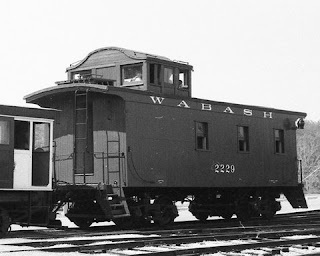 When I bought the 12 caboose kits from Lake Junction Models, Bill Hoss, tossed in a partial kit of a 2200 series Wabash caboose he'd worked on years ago. I'm enamored with the pagoda cupola. I don't know if any of this series of cabooses ever were assigned to Canada, but I have seen images of that style of cupola on cabooses in the yard in St Thomas. Now the kit came to me without end railings, ladders or steps, but I have enough photo evidence to help me create my own. Bill Hoss has indicated that if he receives enough interest, he may consider resurrecting this project and finishing the whole thing and releasing a full kit. If this car peaks your interest, let Bill know. Things happened in the basement. We had company this past week. My good friend from Germany was over visiting with his family for a few days. Thorsten is the man responsible for my membership in Fremo(not FreeMo) and an avid HO modeler. Once he gets the next set of Fremo modules completed at home his plan is to build a large home layout based upon Bellows Falls. In the meantime he gets to come over here and assist me with my layout under the guise of a family vacation. What we have here is St George St, where it crosses the Wabash main on the west side of the Kettle Creek Valley. And to the left of the road is the caboose pocket where Tilley will sit with the replacement caboose for the eastbound Redballs. Now some may think that "big deal. It's only one corner!" Basic fill in all the way to the westend staging! Now all I have to do is add fascia and start with Sculptamold to get scenery really going in this area. I'm so thrilled to have this done. I had been having a bit of a mental block about this area and Thorsten just blew through it for me. Clearly I need him here more often! 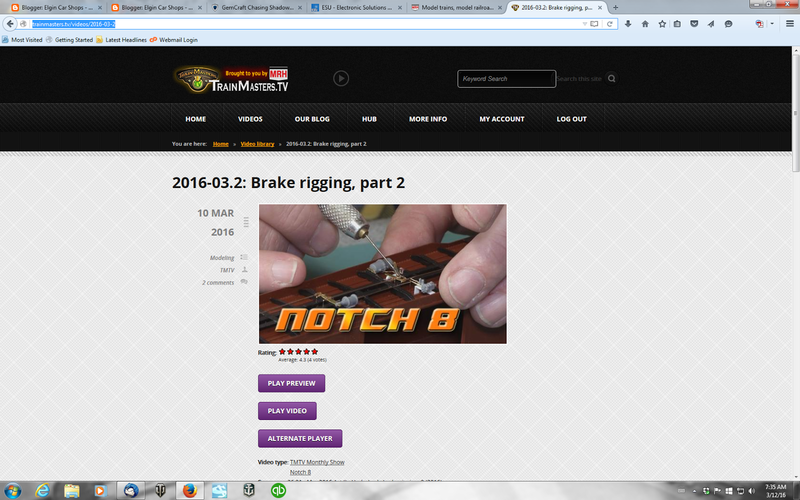 In this episode we complete the plumbing and rodding for the brake system. The odd thing is that there's an hour in total of video for a job that really only takes 15-20 minutes. Must be the constant interruptions from that Trevor guy. Might have to do something about that in the future. So what colour is it? 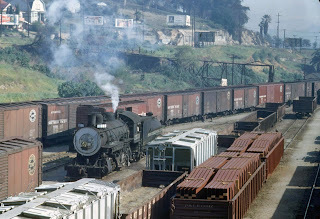 How many different shades of "boxcar red" can you see on those SP boxcars? I see at least 6. He sent me this photo as a result of a dialogue we were having about which paints to use and whose colours are accurate. The demise of Floquil has had a certain impact on modelers options. Fortunately there are still lots of options out there. I don't use acrylics. I've had too many issues with them. And as regular readers know, I'm done with Trucolor. But even with those limitations I have plenty of options. I use a lot of Scalecoat. They have 6 basic brown/reds that I can use to mix and match to get the tones I'm after. The Testors Model Masters enamels are an excellent option as well. While created mostly for military modelers, there's lots of colours to work with. Now for our friends in Europe, Scalecoat is not an option. Shipping issues preclude getting it overseas. Canada has a similar issue. But there are always lots of options. Humbrol comes to mind immediately. And for those fine gentleman who created those extensive colour matching lists for the various railroads; thanks but as the photo indicates, there's lots of variability. It's just that they're big is all. From time to time, I'll paint brass cars for certain regular clients. It makes for a nice departure from the usual routine of things. These 2 lovely cars are Protocraft offerings in O scale. They were both painted with Scalecoat paints, which when baked in the oven comes out real hard and very glossy, ready for decals. I'm particularly enamored with the orange car. Such a standout paint job. Well here's an HO car beside an O scale car. And being brass construction they're hefty as well. I can only imagine the benchwork required to properly support a sting of these cars!